This is a perfect recipe for Easter Sunday- one of my favourite holidays. And like the holiday itself, this recipe is sweet and colorful! 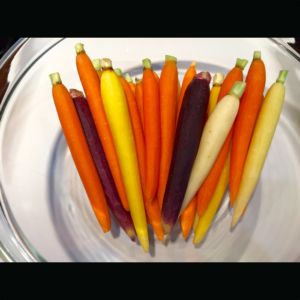 Start by washing, cleaning, peeling if necessary, and drying the beautiful little carrots. Line a cookie sheet or baking sheet with aluminum foil, I used a brownie tin. Place your carrots into a large bowl. Add the olive oil and good balsamic vinegar and mix well until the carrots are completely coated. I like using Leonardo e Roberto’s Gourmet Blends Original Balsamic Vinegar for this recipe because their balsamic vinegars (of many flavors!) are high quality and delicious and I can order them online. Preheat your oven to 400 degrees. 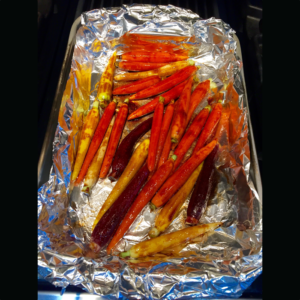 Pour the carrots out into your baking sheet. Bake uncovered for approximately 40 minutes at 400 degrees. 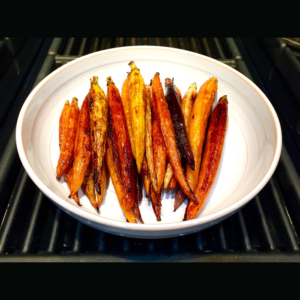 Once you remove them from the oven and let them cool these little delicious sweet baked carrots are ready to eat. These carrots are perfect as a side dish. Since they are tasty served hot or cold you can leave them out for a picnic or buffet style Easter brunch, make them ahead of time, or put them on a salad! Vegan, vegetarian, gluten free, dairy free, simple recipe, side dish.